Food – WHAT IS JAMES WEARING? Well, we here at WIJW have been taking a few moments to recuperate from recent holiday festivities! 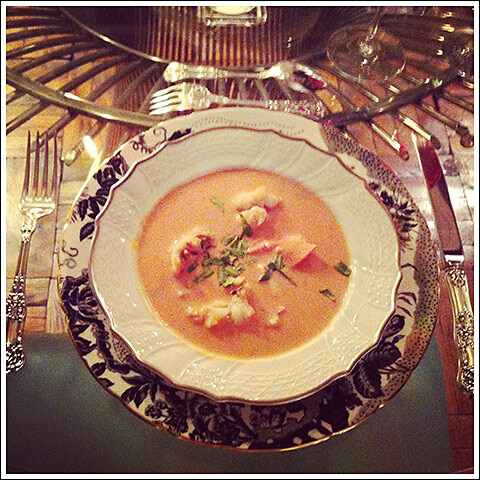 We’ve been missing you terribly in the interim, though, and so we thought to briefly share a recap of our glorious WIJW Christmas dinner – a felicitous feast made possible via the guidance of our friend, the brilliant Chef Alex Hitz, author of My Beverly Hills Kitchen. Our champagne flutes filled and suitable toasts made, Hitz had us start off with his Smoked Salmon Tartar on Cucumber Rounds…with whetted appetites, we moved on to a lovely Lobster Bisque, and then to a ravishing Roast Tenderloin of Beef and Horseradish Sauce with sides of his famous “Potatoes Patio” and asparagus (all served with the most marvelous Médoc). We concluded with an exquisite coconut pudding, and washed it all down with another round of champagne! 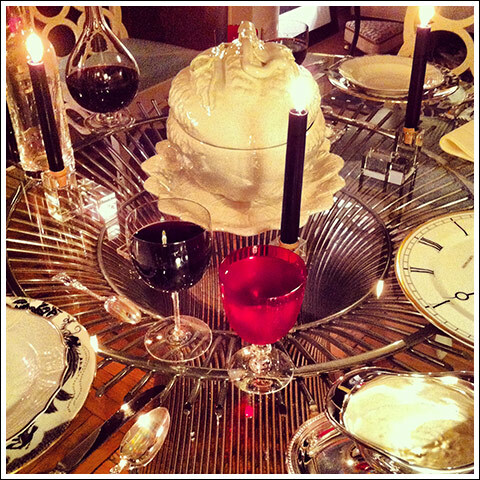 As you know, I do love dressing a table, and, in keeping with the occasion, I went for an elegant setting comprised of: English kings silver flatware, Black Aves china by Royal Crown Derby paired with antique Bavarian soup plates, antique ruby water glasses, Baccarat Brummel wine glasses, candle sticks and decanters, antique Christofle serving pieces, antique white linen napkins, and a white melon tureen by Este as the perfect centerpiece. Needless to say, this was a Christmas dinner to remember! I hope many of our WIJW readers had a chance to reference Alex Hitz’s new book for their own culinary creations this holiday season–I’ve certainly made it an indispensable part of my kitchen! Stay tuned—we do indeed have some fun posts planned ahead, including (but not limited to) a January trip to Lyford Cay for their Design Weekend, and a winter getaway to St. Barths! We trust you are all enjoying this time, celebrating family and friends, and treasuring each moment shared. We happen to think 2013 will be the best year yet. We here at WIJW have a passion for elevated living, and delight in bringing you our very best finds. Perhaps this is why our recent lunch at Park Avenue Summer has us so aglow. Park Avenue takes things a step further than most – not only do they tailor their excellent cuisine to each season, but they elegantly transform their interior space as well, creating that total sensory experience WIJW talks about so much! With a nod to the travels of the famous eighteenth century explorer Captain James Cook, each season’s Park Avenue design loosely references one of Cook’s expeditions. The current Park Avenue Summer is inspired by the Galapagos, with a classic, naturalist vibe while still maintaining a modernist sensibility – white cast tortoise shells hang on gorgeous lacquered panels, salvaged wood with hints of white paint recall summers spent at a treasured seaside destination – the effect provides a cooling escape from the city heat. Their esteemed master chef Craig Koketsu has created a refreshing summer table, with a selection of what one craves this time of year – lobster, summer corn, tomatoes… – the freshest and best that this season has to offer, all exquisitely and inspiringly reinterpreted. I hope this is not too cruel, but I simply have to describe our fantastic luncheon – we began with a scrumptious selection of appetizers – salmon tartar, prosciutto and melon, a sublime butter and sugar corn soup, and crisp artichokes, followed by, and this is no exaggeration, the best lobster salad we have ever had – a lovely rosé to wet the palate – and a tasting of a variety of the most perfect seasonal deserts punctuated the afternoon. Park Avenue Summer is a true culinary and visual adventure. Just as I enjoy the change in seasons, with all the possibility that each new designer collection brings, I look forward to Park Avenue Autumns’s offerings this September. I’ll be sure to bring you a glimpse of this remarkable restaurant and its new interior incarnation then! Located on Park Avenue at 63rd Street, I find it quick and easy to pop in for a gorgeous lunch or dinner. 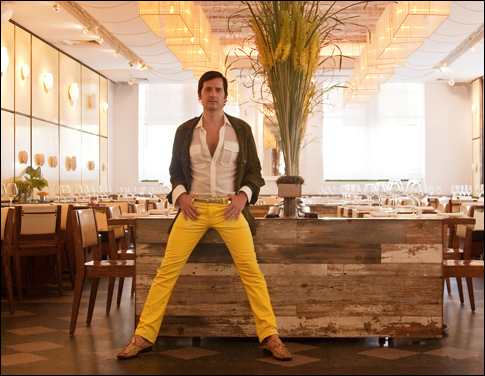 Here in the stunning dining room, I’m wearing a chartreuse suede safari jacket by Gucci, white cotton voile safari shirt, silver chain link belt, python loafers all by Gucci, and bright yellow jeans by Cassette. 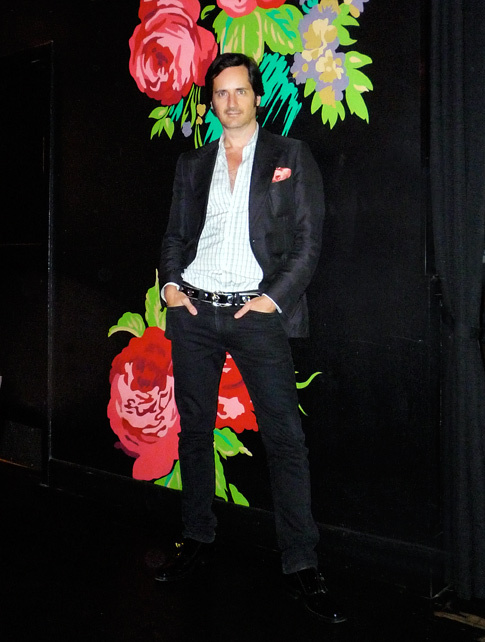 I recently had the pleasure of dining at the new and fabulous restaurant Union Prime designed by the legendary Carleton Varney of the innovative interior design house, Dorothy Draper & Company, Inc. Varney made brilliant use of many of the Dorothy Draper hallmarks, like this fabulous wall I am standing against – it is a Draper chintz pattern “Princess Grace Rose – black” enlarged to an outrageous scale creating quite a striking effect. Touted as a steakhouse for ladies who lunch, the menu includes foods that are directed towards those looking to stay slim and stylish. I feasted on a selection of raw oysters, a light fry of calamari and artichokes, fillet mignon, and creamed spinach, refreshing my palette all along with an absolutely perfect Martini and some very fine wine selected by Union Prime’s excellent sommelier, Doreen. Head down to Union Prime to enjoy a gorgeous lunch or dinner – perhaps I will see you there! I am wearing a black linen denim jacket with suede elbow patches by Gucci, a Yves Saint Laurent shirt in white and black cotton micro plaid, Hermes coral silk pocket square, Seaman Schepps cufflinks in coral and shell, black skinny jeans by Diesel, black patent leather belt with silver grommet holes and silver leather trim by Gucci, black patent leather shoes are also by Gucci.